Arpinder Singh’s life and the story of him fulfilling his ambitions might as well be the stuff of movies but the 25-year-old is not ready to rest on his laurels, anytime soon. 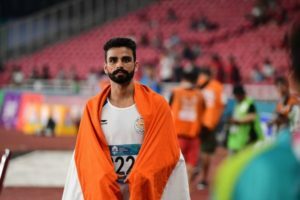 Arpinder Singh – a specialist in athletics, track and field and triple jump is also the man who became India’s 10th gold medalist in the Asian Games 2018 in Indonesia and the fourth gold medalist from athletics. However, this journey to stardom hasn’t been a bed of roses and it has been a tough life for the 25-year-old on and off the tracks ever since he was 16. In 2006, he suffered from an excruciating back injury that had put him down and out for three months. Not only this, Arpinder had to deal with his friends and acquaintances from his native village of Harsha Chhina in Punjab, making not-so-cryptic remarks about his career that according to them was over before it even took off from the ground. When all was lost, it was Arpinder’s father who came to his son’s rescue. Seven years down the line, Arpinder won a Bronze in the 2013 Asian Championship with a 16.58 metre jump followed by a national best record at 17.17 metres made at Lucknow, Uttar Pradesh on the domestic circuit in June, 2014. This was followed by another Bronze in the 2014 Commonwealth Games held in Glasgow. Flying high on his success, Arpinder travelled to Korea for the 2014 Asian Games where he hoped to get himself another feather for his cap but alas, it was not to be. A 16.41-metre jump put him fifth in the overall standings. However, the sudden change in his training and in his approach left Arpinder’s performances lacking and he failed to qualify for the 2016 Rio Olympics. 2017 saw him on a route of re-emergence as Arpinder’s improved training finally began to reflect on his performances and he earned himself a Gold at the Asian Indoor and Martial Arts Games in Ashgabat, Turkmenistan with a career best indoor record of 16.21 metres. It is 2018 and Arpinder carries the expectations of an entire nation on his shoulders as he made a season best record (17.09 metres) at the Guwahati inter-state Championships, left the 2018 Asian Games with a Gold (16.77 metres). Even before the celebrations were over, Arpinder created history by becoming the first Indian to win a medal in the IAAF Continental Cup at Ostrava in Czech Republic as he clinched bronze with a modest effort of 16.59 metres. As the Tokyo Olympics 2020 looms over Arpinder, who looks up to the reigning world champion and Olympic champion Christian Taylor, has set himself a target of 17.60 metres (1 centimetre over current Taylor’s record of 17.59 metres), as he believes that a jump that high will surely put him in the medal category.